On Saturday April 13, 2019 we will be taking a field trip. Member Margie Wallace, will be guide as she shows us some of the collection of books at The Athenaeum of Ohio / Mount St. Mary’s Seminary, Eugene H. Maly Memorial Library, 6616 Beechmont Avenue, Cincinnati, OH 45230. Please arrive at 10 a.m. Directions: The library is on the right side of the building. As you drive in the property turn to the right and there is plenty of parking in front. The library entrance is the far right in the front. After entering the building the library is on the right, designated by a plaque on the wall. The Athenaeum of Ohio / Mount St. Mary’s Seminary is a Roman Catholic seminary and graduate school of theology offering degrees in Divinity, Biblical Studies, Catholic Studies, Lay Pastoral Ministry and Theology. The seminary has existed since 1829 and many of the most rare books in the library came from the collection of Archbishop Purcell (mid-1800s). Our oldest book is Peter Lombard’s Book of Sentences, a book of theology created in mid-13th century. The script in this book is French Batarde. A Graduale is a book of the sung parts of the Mass. 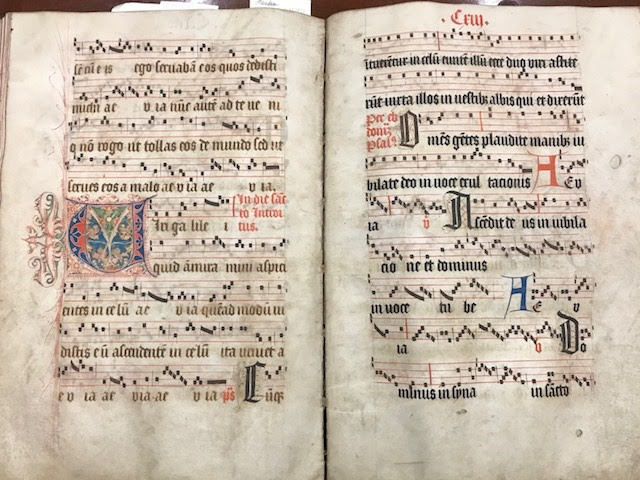 Our Graduale (1528) is from a German monastery and was used for about 300 years. It is a large book designed to be placed on a stand and has vellum pages, a leather cover and bone pieces attached to the cover to keep it on the stand. The most decorated pages are the significant holy days, especially Easter. Low Saxon Bible or Quentell’s Bible (1478) is our oldest printed bible. It is in Low Saxon German on handmade paper and has 113 woodcuts. Nuremberg Chronicle (1493) is a pictorial history of the world in Latin from Creation to 1493. It is the most illustrated book of its time with 1804 woodblock illustrations. The illustrations are from the school where printmaker Albrecht Durer studied. I will pull several more books for our tour to highlight the decorative aspects of our library collection. I’ve attached a few photos of our Graduale and books in our Special Collection. Registration for IAMPETH will open to the public on March 30, and there is probably still time to sign up if you are interested, but not a member yet. For more information about the IAMPETH conference, click the link below. The IAMPETH conference is July 15-20 in Denver, Colorado. This was posted in the Cincinnati Graphic Designer’s group on Facebook, Thursday, April 25, 7 p.m. at Rhinegeist Brewery, 1910 Elm St., Cincinnati, OH 45202.